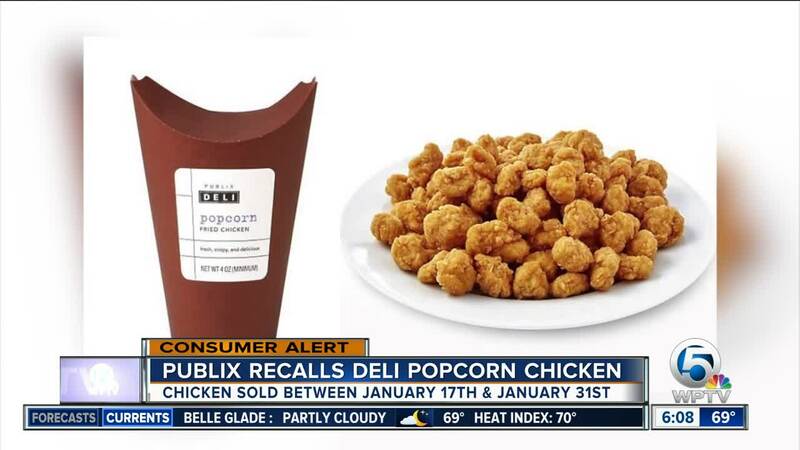 LAKELAND, Fla. — Publix on Thursday issued a voluntary recall for Publix-brand deli popcorn chicken because the product may contain plastic pieces. The popcorn chicken was sold in both hot and refrigerated cases in the deli department in all Publix stores in Florida between Jan. 17 to Jan. 31. Publix said the recall is also in effect for some stores in southern Georgia, southern and coastal South Carolina and southern Alabama. No other chicken products are impacted by the recall, and products available for sale today are not impacted by this recall. Publix customers with additional questions may call the customer care department at 1-800-242-1227. Customers can also contact the USDA Meat and Poultry Hotline at 1-888-MPHotline (1-888-674-685469.